TRUE Sustainable™ energy is available around the clock... not just when the wind blows. Achema 2012 – Fraunhofer Innovation Cluster "Bioenergy"
Pyrolysis of plastic bags parts 1/2/3/4. 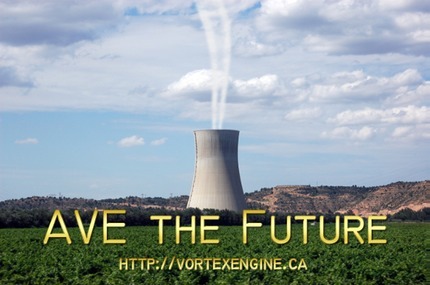 An atmospheric vortex engine (AVE) uses a controlled vortex to capture mechanical energy produced when heat is carried upward by convection in the atmosphere. A tornado-like vortex is produced by admitting warm or humid air tangentially into a circular arena. Tangential entries cause the warm moist air to spin as it rises forming an anchored convective vortex. The work of convection is captured with turbines located at ground level around the periphery of the arena. The heat source can be solar energy, warm water or waste heat.